A sure­-footed blend of the puerile and the poignant. If panto really is in danger of consuming itself, Perth hasn’t received the memo. With its blowsy dames, jokes straight from crackers and local references, it is certainly on the traditional side­ and all the richer for it: pitched just right for a mixed audience, with a warm familiarity that never feels too derivative. This is principally down to Alan McHugh’s script, a smart meditation on troubled masculinity, which draws on the empty bluster of Prince Sebastian (a wonderful Martin McCormick) cursed by a wicked witch to be transformed into a hairy animal, until true love from one who sees his inner beauty breaks the spell. McHugh traces the through line to our ‘self, self, selfie’ culture, by writing an odious parallel character, Blair Atholl (David Rankine) whose wannabe preening rock star has deeply unpleasant shades of controversial ‘comic’ Dapper Laughs, strutting around in his leather trousers. And the progressive women are having none of it. Heroine Belle (AmyBeth Littlejohn) is a feisty yet vulnerable lead, and her harmonies and ballroom scene with The Beast are really rather moving. Auchterdreich, where we find our lads and lassies, is an eccentric Anytoon of listed buildings, bitter cynicism and freezing cold weather. Ken Harrison’s design is equal parts Harry Potter to Harry Lauder, where portraits really could follow you around the room- some of the ensemble contained within the frames have a tendency to pop out and in on occasion. Barrie Hunter’s dame Betty Blumenthal and idiot son Boaby (Harry Ward, dishing out pure slapstick) make for a fantastic, freewheeling double act with their multiple innuendos, wordplay and fart gags, but are almost upstaged by the equally audacious Ugly Sisters, Deadly Nightshade and Poison Ivy (Amanda Beveridge and Angela Darcy) whose sardonic patter, all ribald jokes focused around the menopause, are reminiscent of a Scottish take on Patti and Selma from The Simpsons . Their bluesy cover of Prince’s Kiss is more like a kiss-­off. The ballad reprisals are the only flaw here­ one iteration of Emeli Sande’s Read All About It is more than enough, and it seems Ed Sheeran’s Thinking Out Loud is ubiquitous these days, but it’s an inventive, skiffle­soaked cover of Pink’s Get the Party Started, which has Ward playing an electric geetar like a badass, that feels charmingly chaotic. Uptown Funk, this year’s panto go­to pop tune is even tolerable, given a chavvy makeover which looks like an explosion in JD Sports. Audience participation is also kept to a minimum, although there is a surreal segment which goes a little Ontroerend Goed (albeit kinder) where the cameras are turned on some mortified people in the front row, chatted­-up by the naughty Blumenthals. And by the time the obligatory final singalong arrives, it’s hard to not warm to it all. 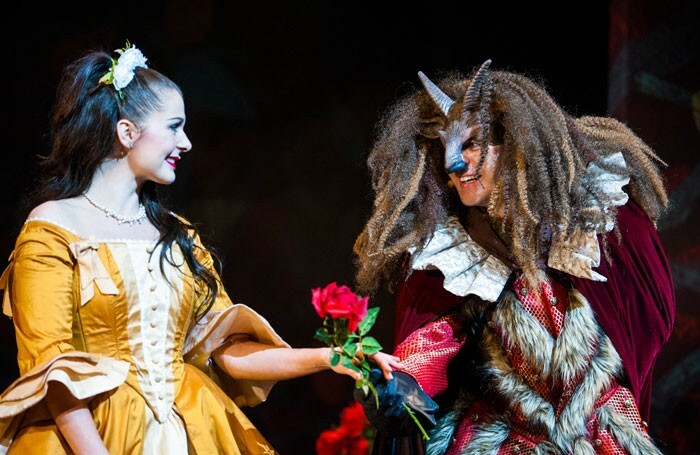 Beauty and the Beast may not deal in cheeky meta­narratives like other pantos, but its sure­footed blend of the puerile and the poignant rocks the auditorium.